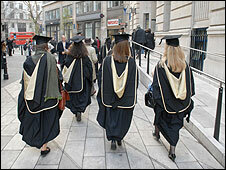 Universities in England are failing to safeguard degree standards, according to a damning report from MPs. The current system for ensuring quality is "out of date and should be replaced", the Commons universities select committee concluded. "Inconsistency in standards is rife," said committee chairman, Phil Willis. Universities UK attacked the report as "ill-thought through" and rejected the accusation that university leaders were "defensive and complacent". The hard-hitting report calls for urgent action to improve how universities safeguard the quality of degrees. It describes as "absurd and disreputable" the claim that the growing demand for courses, including from overseas students, is proof that university standards are being maintained. The cross-party committee attacks university leaders for failing to "give a straightforward answer to the simple question of whether first class honours degrees achieved at different universities indicate the same or different intellectual standards". And the MPs question why universities have failed to explain the rapid increase in the number of top grade degrees being awarded. To protect the "integrity" of degrees, the committee calls for a radical overhaul of the current watchdog, the Quality Assurance Agency, replacing it with an independent body charged with maintaining academic standards. The report casts doubt on the reliability of self-regulation by universities and calls for tighter rules for external examiners and a way of comparing standards in different institutions. "We are extremely concerned that inconsistency in standards is rife and there is a reluctance to address this issue," said Mr Willis, chair of the Commons Innovation, Universities, Science and Skills Committee. The report says it is "unacceptable" for higher education to receive £15bn in taxpayers' funding "but be unable to answer a straightforward question about the relative standards of the degrees of the students". As an example, the report says that there was no clear answer to MPs' attempts to find the answer to whether an upper second history degree from Oxford University and Oxford Brookes were equivalent . Where whistleblowers have revealed worries about degree standards, the committee says they must be given better protection. MPs also recommend a national system of bursaries to support students, removing differences in the amounts offered by individual institutions. This proposal for a national bursary has been supported by the National Union of Students and the Million+ group of new universities. NUS president, Wes Streeting, also welcomed the questions raised about value for money from degree courses. "Tuition fees in England were trebled in 2006, but students have not seen a demonstrable improvement in the quality of their experience. "We find it astonishing that universities continue to demand ever higher fees without showing how they make a difference to the people who pay them," said Mr Streeting. But university leaders have rejected the criticism levelled at the higher education sector. "We are rather dismayed and surprised by this outburst," said Wendy Piatt of the Russell Group of leading universities. "Universities are not schools. An essential feature of a university is its academic freedom and autonomy, with the responsibility to award degrees and uphold standards," she said. Diana Warwick, head of Universities UK, said: "We reject the suggestion that the way to improve the system that protects standards is to create some super-quango or Ofsted-style Quality and Standards Agency. This seems to us a sledgehammer to crack a nut." But Paul Wellings, chair of the research-intensive 1994 Group of universities, emphasised the need for maintaining quality across a diverse higher education sector. The QAA watchdog, which the MPs want to replace, warns that "care needs to be taken that we do not put at risk the benefits of a diverse and flexible higher education system". The report has also been challenged by Lord Mandelson, Secretary of State for Business, Innovation and Skills. "I don't recognise the committee's description of our higher education sector, which is in fact world class and second only to the USA as a top destination for overseas students," said Lord Mandelson. The Conservatives' university spokesman, David Willetts, said the report was a "refreshingly frank assessment of where things stand".